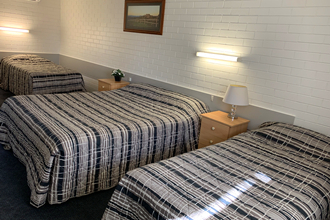 We offer a variety of accommodation options including Queen Rooms (1-2 persons), Twin Rooms (1-3 persons), Family Rooms (3-5 persons) and Serviced Apartments (1-5 persons). 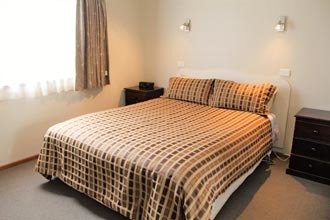 Queen Room, consisting of 1 Queen Bed, non-smoking and include large suite bathroom, LCD flat screen TV, free WiFi internet and Tea/Coffee making. 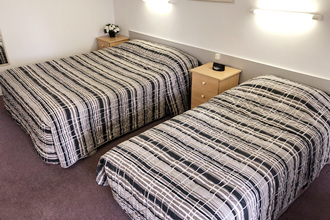 Twin Room, consisting of 1 Queen Bed and 1 Single Bed, non-smoking and include large suite bathroom, LCD flat screen TV, free WiFi internet and Tea/Coffee making. Family Room, consisting of 1 Queen Bed, 2 Single Beds and 1 Trundle Bed, non-smoking and include large suite bathroom, LCD flat screen TV, free WiFi internet and Tea/Coffee making. 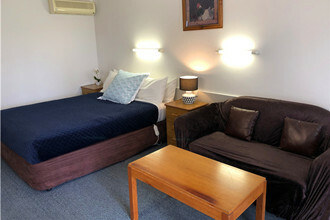 Serviced Apartment, consisting of 2 bedrooms, one has 1 Queen Bed, another has 2 King Single Beds and 1 Sofa Bed in the living room, non-smoking and include large wheelchair friendly bathroom, full size kitchen, LCD flat screen TV, free WiFi internet and Tea/Coffee making.